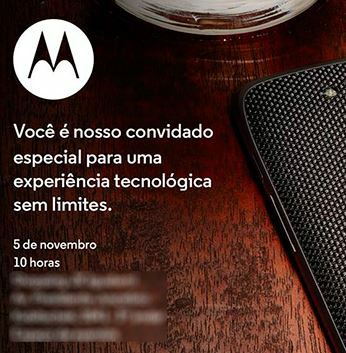 Recently we saw the launch of Flagship device from Motorola named the Moto Droid Turbo which has some amazing features was launched by Verzion in USA but no news about the release in rest of the world was available or given at that time, but after an invite a Portuguese website got for the launch of Moto Maxx which when seeing the image resembles the Droid Turbo exactly. A technology blog was the first to spot this and the image we posted is from the blog – Technoblog which is about the launch of the device in Brazil by Motorola. The name of the device as Moto Maxx is not given anywhere but it is suspected to be named as Moto Maxx. The Motorola Droid Turbo is the flagship device by Motorola with a 5.2 inch screen which has 2560 x 1440 pixels resolution and is powered by a Qualcomm Snapdragon 805 quad core processor which clocked at 2.7GHz and it is running on Android 4.4.4 and comes with a 3GB RAM and 32GB storage. The back panel of the device is also stylish and comes in three colors. Motorola Maxx if it is going to be released around the world including India will be a great device to counter the likes of S5 and other top end smartphones with because it is sporting a Snapdragon 805 processor which is seen in Note 4 alone at the moment.